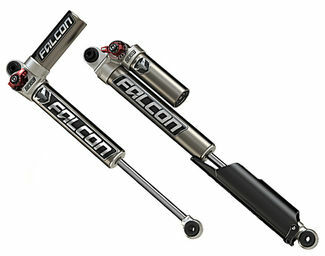 Falcon Shocks don't come cheap, but in this case you get what you pay for. 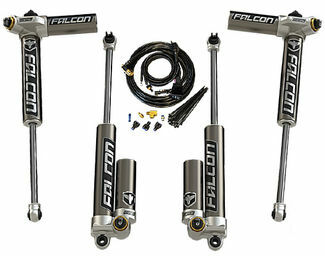 These high performance shocks are perfectly tuned for each vehicles suspension and look just plain amazing. 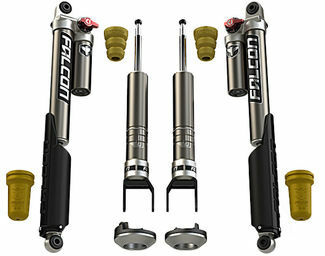 Falcon Shocks is a premium brand of shock solutions offered by Jeep component specialists TeraFlex. 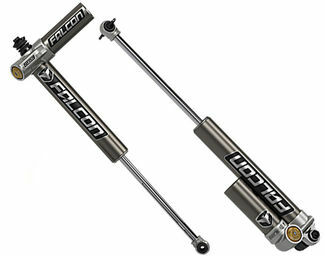 With 70 years of Jeep tinkering experience under their belt, TeraFlex set out to make Falcon Shocks the most customizable and versatile brand of shock absorbers on the market. 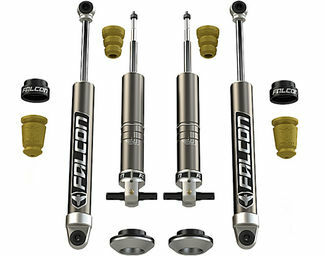 While Falcon Shocks mostly cater for the Jeep Wrangler, they also offer solutions to fit a wide range of truck models including the GMC Sierra, Chevrolet Silverado, Dodge Ram 1500, Ford F150, and the Toyota 4Runner and Tacoma. 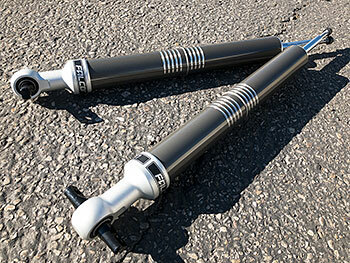 The series 2 line of shocks, available on the TJ and TL Jeep Wrangler, are monotube design shock absorbers offering a comfortable ride at an affordable price, packaged into a compact unit. The 2.1 sports model also features increased compression damping, providing a firm ride in even the most demanding of environments. These units are housed in a 2.25" shock body, the largest size that will fit a JK without further modification to the vehicle. Series 3 shocks are available for JL, JK and TJ model Wrangler Jeeps. This series boasts some major upgrades over the second series, most notably a 'piggyback' design. 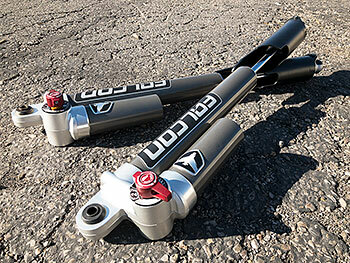 Each shock holds a reservoir of fluid to the side of the main shock assembly. The main advantage of this design is heat management. Excessive heat buildup in your shock fluid can cause a reduction in damping force, making your shocks feel less firm when put under stress. In a piggyback system, the external reservoir allows your shocks to maintain a consistent heat and viscosity while under heavy workloads. The 3 series also comes with a range of ride adjustment options. The most advanced system comes on the 3.4 series, which features a 'Remote Air Adjust Switch', allowing you to shift from a firm ride to soft ride from the comfort of your Jeep's cab. Other models, such as the 3.2, allow you to choose between eight different ride styles, fine-tuned via a micro position adjustable dial on the shock body. These JK Wrangler-specific parts are designed to deliver equal force (EF) side-to-side resistance for uniform and reliable steering wheel response. Delivering a consistent bi-directional turning force greatly improves balance and return to center steering characteristics. 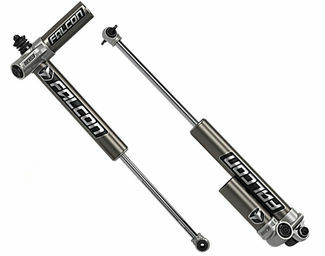 Unlike other solutions on the market, Falcon Nexus EF steering stabilizers require no hydraulic external reservoir, which eliminates the shaft displacement issues commonly experienced with other stabilization rigs. Drivers of the Ford F-150, RAM 1500, Chevrolet Silverado/GMC Sierra 1500, and the Toyota Tacoma can take advantage of Falcon's new range of truck performance systems. These currently come in two flavors; the 'Sport Leveling System' and the 'Sport Tow/Haul Shock Absorber System'. Both of these systems are complete shock overhauls, providing all of the necessary parts to increase the sports handling or towing capability of your truck. 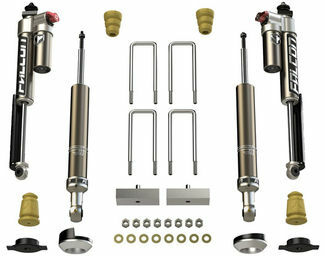 Both offer monotube front shocks, while the Tow/Haul model also upgrades the rear shocks absorbers to a set of piggyback shocks. 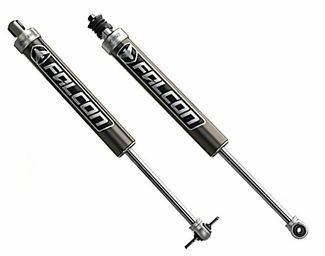 All Falcon Shocks are salt spray corrosion resistance tested to 1,000 hours and covered by a three-year warranty.